Flamenco is the traditional song and dance of the Gypsies (flamencos) of Andalucia. Its evolution is a source of great debate with no accepted explanation of how flamenco resulted from the cultural influences of such diverse regions as North Africa, Southern Europe and the Near and Far East. Flamenco has never been more popular in Spain and abroad than it is today with a new generation of flamenco performers in the post-Franco era who have broadened flamenco’s appeal to an international audience. The art form developed over several centuries from Gypsy, Moorish, Andalusian, and other roots. Flamenco music and dance became popular in the early 19th century as café entertainment. Canto (“song”) is the core of flamenco, and like baile (“dance”), it has three forms: grande or hondo (“grand” or “deep”), intense, profound songs, tragic in tone, and imbued with duende, the transformation of the musician by the depth of the emotion; intermedio (“intermediate”), moderately serious, the music sometimes Oriental-sounding; and pequeño (“small”), light songs of exuberance, love, and nature. Individual genres include the light bulerías; the more serious soleares and its lighter descendant, the alegrías; the fandangos grandes, a serious adaptation of a lighter non-Gypsy genre; the malagueñas, an offshoot of the fandangos; and cantos grandes such as the siguiriyas gitanas and saetas. Both text and melody of these songs, like the flamenco dance, are improvised within traditional structures such as characteristic rhythms and chords. Zapateado, intricate toe- and heel-clicking steps, characterizes the men’s dance; the traditional women’s dance is based more on grace of body and hand movement. The baile grande, especially, is believed to retain elements of the dance of India, where the Gypsies originated. Castanets, found in Andalusian dance, are not traditional to flamenco. Song and dance may be accompanied by jaleo, rhythmic finger snapping, hand clapping, and shouting. In the 19th century, guitar accompaniment became common for many genres, and guitar solos also developed. In the 20th century, commercial pressure distorted much traditional flamenco dance. Seville is probably the best place to watch flamenco dancing with quality shows available all year round. In the caves of Sacramonte Granada’s gypsies provide great entertainment for visitors. Whilst flamenco is just as popular in Cordoba as it is in Seville and Granada there’s less choice as to venues where you can watch it. Outside Andalucia, Madrid is the best location to watch quality flamenco. 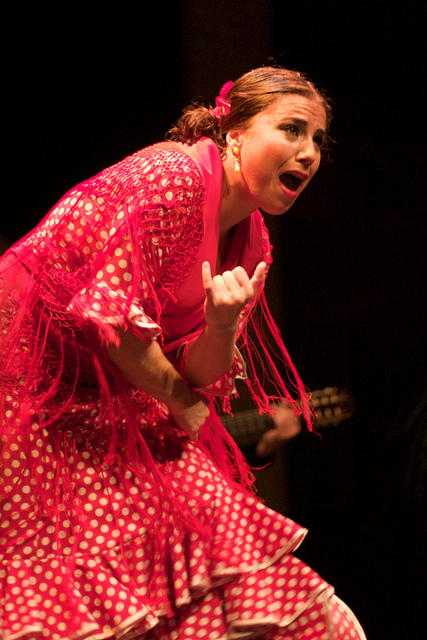 There are fine flamenco shows which can be pre-booked in Madrid, Seville and Granada. Amazing performances. There’s nothing like it elsewhere.